That Donald Trump is a narcissistic braggart was never in doubt, and was confirmed again with the delegates' ripples of laughter at his recent speech in the United Nations. The more intriguing question was always how would a lifetime businessman behave once he became president? We now have the answer: intense finance nationalism. Much of the attention on Trump's posturing has been focused on his economic (as opposed to financial) nationalism, particularly the trade surplus with China. This is significant, but mainly for smaller economies like Australia, not the two giants in question. America and China are continental economies — trade is only on the margin — and they would not be greatly damaged by a sharp reduction in mutual commerce, at least in purely financial terms. The more significant question is how China will be affected if its systemic acquisition of American technology and knowhow is impeded. Trump's weaponising of America's financial advantages is a more important and novel development. He seems to have concluded that financial war is more effective than military war. America's proxy war in Syria is close to lost, and the US is running out of countries to attack. Just the threat of bombing Iran would have catastrophic consequences, because it is likely insurers would refuse to guarantee the ships coming from the Persian Gulf through the Straits of Hormuz, imperilling about two fifths of the world's oil supply. At a localised level the administration's use of finance as a weapon is becoming extreme. For example, Trump's bloodthirsty national security adviser, John Bolton, has threatened to freeze the US assets and impose a travel ban on judges, prosecutors, and staff of the International Criminal Court in the Hague because they have shown an interest in investigating America and Israel. Asset freezes (which is really theft) have been used against Russians, Venezuelans, Nicaraguans and Turks. The Trump administration has threatened to freeze the assets of Cambodian President Hun Sen, and is contemplating doing so on Iraqi Prime Minister Haider al-Abadi because he has not been hostile enough towards Iran. This extraordinary behaviour reveals the state of mind of the Trump administration, which sees business-style standover tactics as a thoroughly good option. But it is the system-wide shifts that are more important and which may have a lasting impact. "If these developments take hold, it could be the beginning of a genuine multi-polar financial world." The United States has ruled the world for more than five decades because it has the globe's reserve currency: the United States dollar. Initially that was because oil was transacted in US dollars, but now it is because of the enormous growth of global finance. Daily trade in the US dollar is over $US4 trillion, much of it derivatives, such as interest rate swaps. As economist Yanis Varoufakis has pointed out, Trump's strategy, using divide and rule tactics, seems to be to 'blow up existing multilateral conventions and build from scratch a new global order resembling a wheel, with America its hub and all other powers its spokes'. As Varoufakis has also noted, America can do that because it has the world's reserve currency. It is why America can run massive budget deficits and not be penalised in the way that, for example, Argentina or Turkey are currently being punished (those countries made the mistake of having high debt in US dollars). Power is more effective when it is hidden. Resistance is less likely if there is only a sketchy awareness of what is happening. 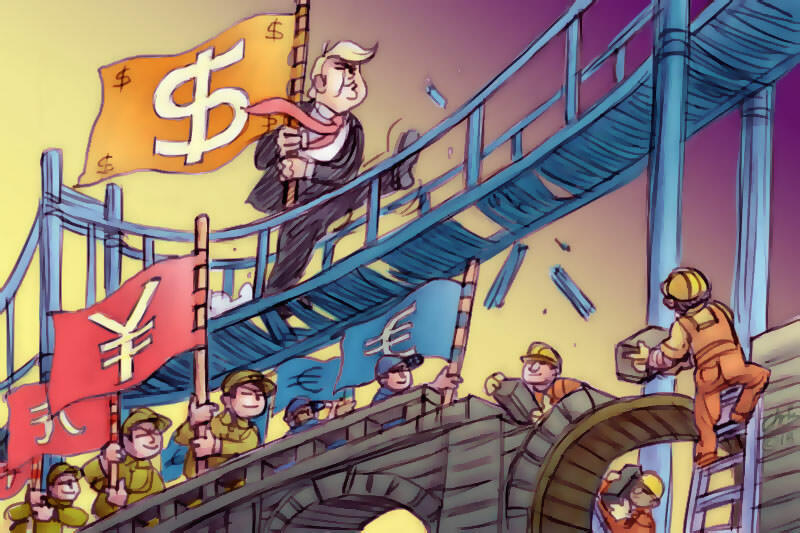 Trump's leveraging of the US dollar — especially threatening penalties on companies that continue to trade with Iran — is bringing the US currency power more into the open and it has sparked a hostile response from the Europeans. The US dollar-dominated financial system uses a transactional architecture called SWIFT for international transfers. The Chinese flagged that they would be setting up an alternative to SWIFT, called the China International Payment System (CIPS), but it is only in its infancy and the yuan remains fixed against the US dollar. More significant is that the Europeans, furious at America's bullying tactics over Iran, are also working on an alternative to SWIFT to sidestep the US dollar-dominated payments system. If these developments take hold, it could be the beginning of a genuine multi-polar financial world. We could be witnessing the biggest financial shift for over half a century. As long as China cannot bring itself to imitate the benign political infrastructure of Taiwan, or South Korea or Japan, as long as post-Christian Europe doesn’t know whether it’s Arthur or Martha, and as long as America’s ‘enemies’ does not include one proper democracy where the rights of the individual are protected in practice and not just on parchment, there should be an international wheel at which the US is the hub and the reserve currency is the US dollar. Poke holes in the US umbrella and you’ll be rained upon by any assortment of international undesirables – from their kidneys. Another rant on Trump....I am tired of 'Trump' news/analysis/whatever. To place this article under 'Economics' does not do justice to economists. Sad that Eureka Street has degenerated to this level. Always good to read anything by David James. One can only hope that the whiz kid economists in the Australian bureaucracy and in the Reserve Bank are on to Trump's methods. And are advising our Government accordingly. Trump has cut taxes for the rich and also started a trade war, which I think will come back to bite Americans. He is a supporter of the gun lobby which leads to the deaths of many Americans, even many school children. But I think the worst thing about Trump is his denial of climate change and his pro-fossil fuel policies. Climate change is the greatest challenge of our time and with national governments like that in America and Australia, both of whom are pandering to the fossil fuel industry, no wonder we have a climate heading for more than 3 degrees of warming by 2100, with the death and devastation that will cause. Wake up America! Wake up Australia! The more prolonged droughts, more devastating tropical storms and increasinglly fierce fire storms we have already are but a taste of what's to come! It's not just the economy, Stupid! It's the natural environment on which all life on Earth depends! More and more people I meet in America believe Trump has been a good influence on the economics of the country. A despicable character but a needed change on many other levels. David you cannot be serious in suggesting the asset freezes of criminal elements from Russia, Venezuela, Nicaragua, Turkey constitutes theft. Have you not kept up with the Magnitzky act ? Have you not been following the writings of Xu Zhiyong? https://www.nytimes.com/2018/09/18/world/asia/china-dissident-xu-zhiyong.html?emc=edit_mbau_20180918&nl=morning-briefing-australia&nlid=6234580920180918&te=1 You would defend the totalitarians ? The despots ? The murderers ? This article is not in keeping with any sense of Jesuit social justice. David, what do you say to the pro independence Taiwanese ? What do you say to the Tibetans? What do you say to the jailed and tortured political dissidents in China ? The Falung Gong followers ? I am aghast that Eureka would publish this.